Productivity Definition: Productivity is termed as a measure of the capability or performance of a person, machine, organization etc., in converting inputs into valuable outputs. The success of an organisation has a linear relationship with employees productivity. Hence significant of research has been conducted behind to figure out how to increase the productivity of employees.While employee acquisition and retention take up a lot of attention , employee productivity also deserves its due attention for the good of the company. Though employee talent is an asset for any business organisation, it’s no easy task to make employees perform at an optimum level throughout and produce the results which you believe they are capable of. According to a Bersin & Associates study, organisations with strong learning culture have 37% greater employee productivity. A VIBE study also notes that productivity increases by 16% in comfortable, ventilated and safe workplaces. Not to mention a 24% increase in job satisfaction which in return reduces absenteeism and increases employee retention rate. Let’s see which all factors can significantly influence the rate of increase of productivity of employees. Accountability: A Workplace Accountability Study notes that while 91% of people rank accountability as one of the top development needs for their organisation, a full 82% have no ability to hold others accountable. So the accountability culture in your company must begin with well-defined employee roles, responsibilities and clear goals. You can’t hold employees accountable if they have no idea what the goals are. Also, accountability is just as much about rewarding good performance as it is about calling out the non-performers. This carrot and stick approach to make employees produce results is what works best for improving productivity. Project Management Tools: Project management refers to planning, execution and monitoring of a project for desired outcomes. A project or work , be it small or big, has its risks and failures. A well planned and executed project will ensure the team’s productivity. These days where software has taken over most business processes, installing a good project management tool will help in reducing the human error and gives the company a better control in assessing options and organising priorities.A few productivity tools you can make use of include Google Docs, Dropbox, Producteev, etc. Motivation: One task that should be at the top of every employer’s to-do list is motivation of employees. According to a recent study by economists at the University of Warwick, happy employees are 12% more productive and unhappy employees are 10% less productive at the work. In case you’re pondering on ways to motivate your employees, you may refer to the tips from our experts on how to motivate employees. Teamwork: Together Everyone Achieves More is what a team stands for. 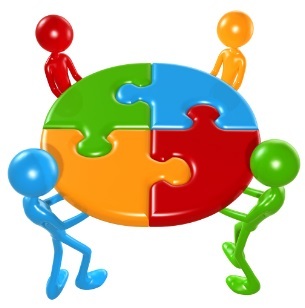 A company has to ensure that every member of the team is working in collaboration with each other.Only than the desired results will be achieved. According to a Gallup study, poorly managed work groups are on average 50% less productive and 44% less profitable than well-managed groups. There are tools available to help remote team members work better together as a team. For example, use Google Drive, Trello, etc., for storing data and files in one place. Platforms like Slack, flock and Telegram can be used for internal chat and collaboration among team members. Technology Upgrades: One of the great ways to increase productivity is training your employees on new technology and making sure that they are able to use the latest software or tools related to your business processes. For example: Usage of different SaaS tools like Google Docs, sales acceleration tools like Lucep, accounting software like Quickbooks Online, etc. Proper technology tools enables the managers to keep track of employees productivity. It helps them to check whether the productivity is in tandem with the company’s goals. Work Life Balance: Balancing professional and personal life is an art which has a far-reaching impact. One can design his/her life more productively by setting work boundaries while respecting personal boundaries. By scheduling priorities , using latest tech tools to access the team when working from home (remote locations) and while travelling, etc will help you to scale down the stress. Learn more about How Work Life Balance increases productivity of your Organisation. In the end everyone needs to be appreciated and acknowledged for the work they have done. A company which conveys to e the employees how much they are valuable to them will have the most trusted and productive workforce.